In an effort to improve quality and contain the growing cost of health care, states are increasingly undertaking a shift away from fee-for-service reimbursement models that reward quantity and moving toward alternative payment models that reward value. Many of the states leading the way in payment and delivery system reform have received State Innovation Model (SIM) awards from the Center for Medicare & Medicaid Innovation (CMMI) that have aided in accelerating that work. 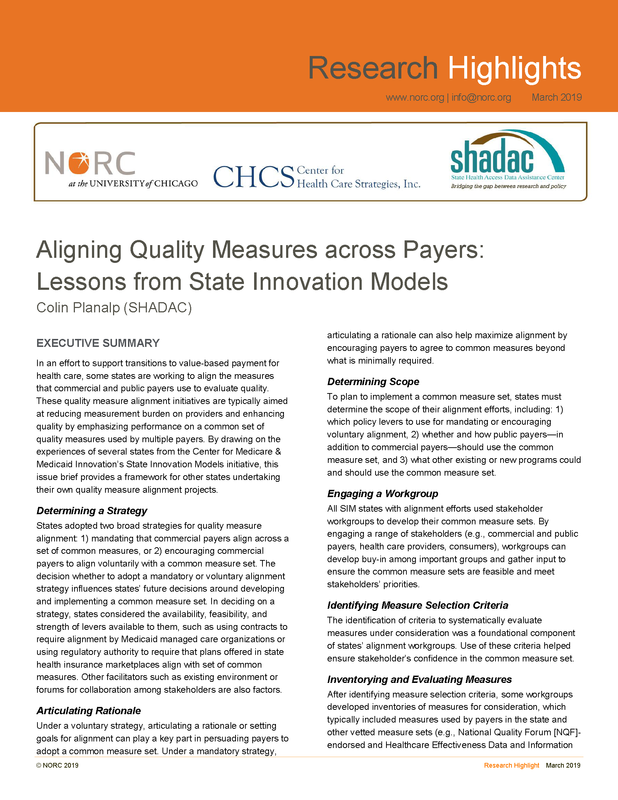 A new issue brief from SHADAC researcher Colin Planalp examines the work of five SIM states to develop common measure sets that align quality measures across private and public payers—a strategy aimed at reducing administrative burdens on providers and giving focus to quality improvement efforts. Drawing from the experiences of Connecticut, Massachusetts, Minnesota, Rhode Island, and Washington, the brief outlines a framework for other states to undertake quality measure alignment projects in the future. This paper was produced by SHADAC with support from the CMMI. SHADAC is part of a team led by NORC at the University of Chicago that serves as the SIM Resource Support Contractor. SHADAC and other technical assistance partners support states and the Innovation Center in designing and testing multi-payer health system transformation approaches. One of the first key decisions made by states undertaking multipayer quality measure alignment is the choice between adopting a mandatory approach—requiring private payers to use the measure set—or voluntary alignment approach—encouraging stakeholder buy-in via engagement and needs prioritization. The issue brief examines both methods and highlights important considerations of each using examples of voluntary alignment from Connecticut and Washington, and examples of mandatory alignment (e.g., statutory and regulatory authorities) in Massachusetts, Minnesota, and Rhode Island. Each state referenced in the brief emphasized stakeholder engagement (i.e., establishing workgroups with representatives from state agencies, commercial health plans, health care providers, consumer advocates and other stakeholders) to ensure that the common measure sets met important priorities and to develop buy-in for adopting measures. The brief examines states’ stakeholder engagement strategies, as well as other techniques employed by the states to bolster their new common measure sets such as Washington’s adoption of the measures in its Medicaid and state employee health plans. The issue brief also lays out a roadmap for other states to develop their own common quality measure sets, pulling lessons from the processes employed by the five study states. The state workgroups tasked with selecting metrics for their common measure sets reported that their responsibilities generally entailed identifying and incorporating shared priorities and goals in selecting common measures, cataloguing measures currently in use within the state, selecting criteria for systematically evaluating potential measures, and evaluating and selecting measures according to those agreed-upon criteria. As a final step, the states profiled in this brief also have created and implemented processes to ensure their common measure sets will remain effective and relevant by periodically updating the measure sets by either removing measures where provider performance has topped out and/or adding new measures to address evolving quality priorities. Including workgroup members from all stakeholder groups: commercial, public, state agencies, providers, consumers, and any other key groups. Encouraging stakeholder engagement in all aspects of selecting and implementing common measure sets. Strongly defining a rationale to promote stakeholder involvement, buy-in, and engagement. Selecting measures that are meaningful and practically applicable for providers and payers alike. Adopting a common measure set in public programs in order to promote mirrored alignment in commercial programs. Continuing to review measures after they have been set, and updating or modifying if necessary. Read the full issue brief for more details on aligning quality measures in states.